Hi Clair! Your Open House BouSham has an unusual name – where does it come from? The name BouSham is a combination of my name Clair Boubli (Bou) and Shyama Ruffell (Sham). It originally started as a joke, but we kind of liked it and it stuck. 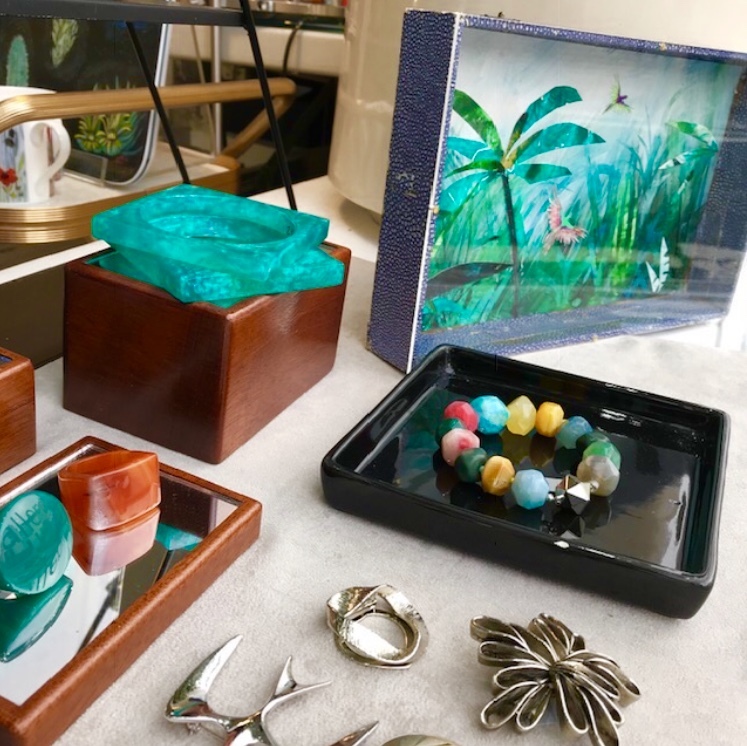 The BouSham collaboration, with my life-long childhood friend Shyama, has grown over the last two years as a popup, showcasing an array of established local artists in various destinations in the South East. There’s nothing better than to work doing what you love with your best friend. The creativity and the laughing never stops! 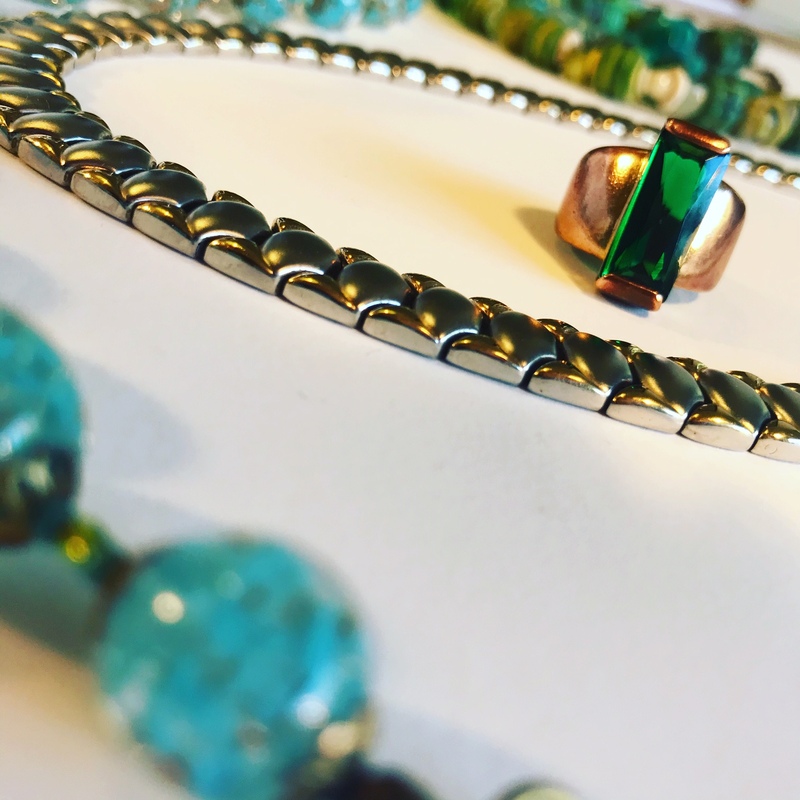 Can you tell us a bit about the jewellery you produce and how it is made? My passion for my work has taken me all over the world, sourcing an incredible variety of natural materials. 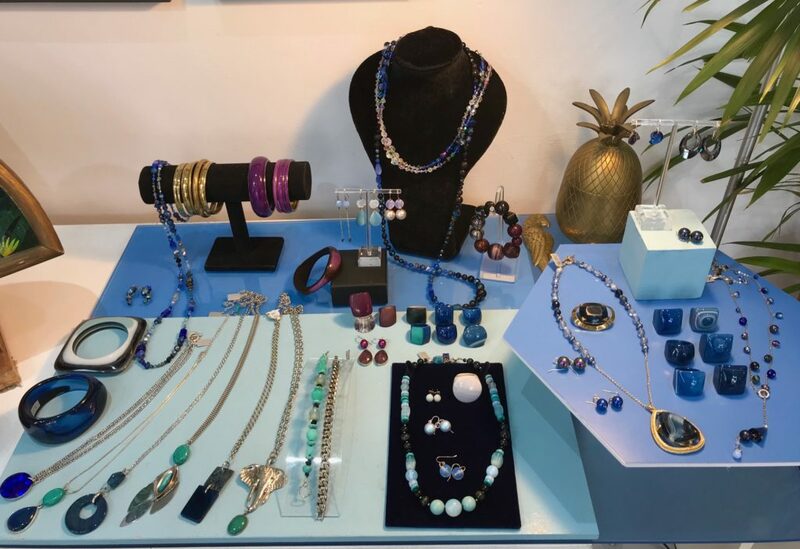 I work with Brazilian hand-cut semi-precious stones as well as organic Amazonian forest materials, such as seeds and pods collected from the forest floor, which I hand carve and dye. I also works with precious metals, setting Amazonian seeds and desert stones with hand-cast forms in bronze, silver and gold, as well as hunting markets for antique crystal, glass and vintage metal wherever I travel. 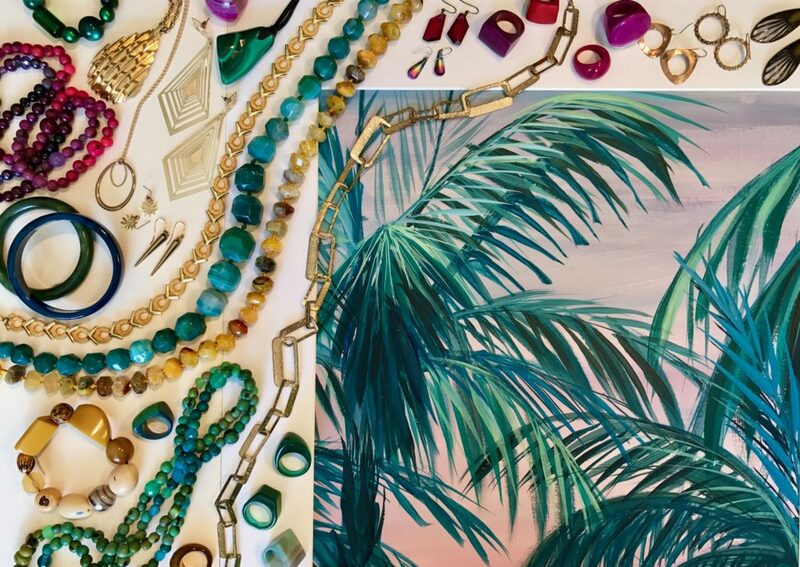 I revitalize these vintage finds into beautiful contemporary jewellery pieces. Like a magpie, I’m always finding treasure that is thrown up by nature and place. My work tells a story, colourful and unusual, it has a heritage and whole array of experience and knowledge hand-crafted into every piece. Your Open House has a focus on recycling and sustainability and also on traditional crafts, can you tell us a bit about each of these and how you selected your guest artists? This show has been curated with a strong emphasis on sustainability, as a response to the environmental impact of industrially manufactured products. 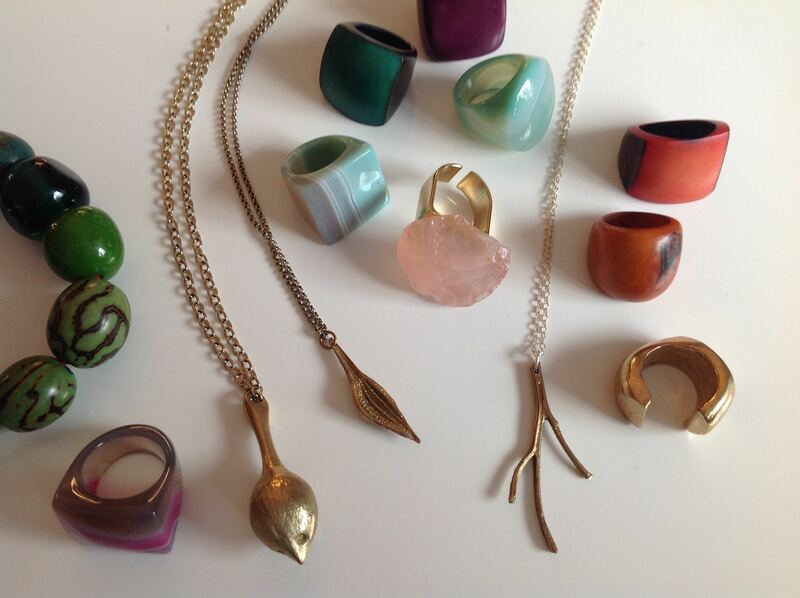 It showcases an array of local artists and makers using sustainably sourced materials. Jute, cotton, rope, recycled textile yarns, natural fabrics and environmentally friendly inks. Discarded flip-flops, waste-paper and recycled plastics and metals are all employed, reformed or reworked into striking artworks and craft pieces. The artists are like alchemists, turning discarded materials into objects of beauty. In total BouSham has gathered 12 ethically minded artists for this show, whose work reflects our ecological ideal, returning to the ethos of traditional craftsmanship and materials. The show includes hand-formed ceramics, thrown vessels and sculpted terracotta characters; embroidered and hand printed textile accessories, alongside fine art paintings, prints and cards. The work is carefully curated within the space and combined with furniture, plants, props and lighting to build our signature aesthetic. Alongside myself, the artists include Shyama (Sham) who paints nature inspired, bold, vibrant, original artworks. Utilising as a resource the paper pallets that would normally be scrapped. She cuts and configures them into intricate layered collages. To create the finished piece she reuses vintage boxes and frames sourced from auctions and markets. There is also Cocoon&me, who works with natural high quality and sustainably sourced materials using artisanal techniques such as crochet, knitting and macramé to produce a textured range of contemporary and beautiful interior accessories. Ocean Sole sounds really interesting – we’d love to hear a bit more about them. Ocean Sole is an amazing social enterprise that pays coastal communities to collect around 700,000 discarded flip-flops – and other rubbish – off the beaches of Kenya and along the East African coast each year. They produce colourful animal sculptures, skilfully carved from discarded flip-flops. As well as being responsible for clearing up the beaches and the sea, Ocean Sole also provides employment and livelihoods for a large number of people and contributes 10% of the revenue to marine conservation programmes. They have 92 full time employees in Kenya who turn the flip-flops into beautiful animal sculptures. Each sculpture purchased helps remove plastics from the ocean and provides much needed employment in Kenya! How many years have you been taking part in the Artists Open Houses festival? I have been a host and a participant in the Brighton AOH’s for the past 7 years. I find Artists Open Houses an absolute inspiration! It’s truly amazing being part of such a concentration of artistic talent and creativity. When hosting, I love welcoming people into my space, it is always so interesting meeting such a diverse and engaging circle. People who have come to explore and enjoy all that us Brighton artists have to offer. BouSham is looking forward to inviting visitors in to enjoy our colourful and inspiring environment. The post AOH talks to BouSham Open House appeared first on Artists Open Houses.